Our plugin can create sitemaps for the various sections of your website. We combine all of the individual sitemaps into a sitemap index. This means you only have to submit the sitemap index link which is automatically updated as you add, remove, or change your content. The same sitemap index is used by our add-ons like Yoast SEO: News and Yoast SEO: Local. 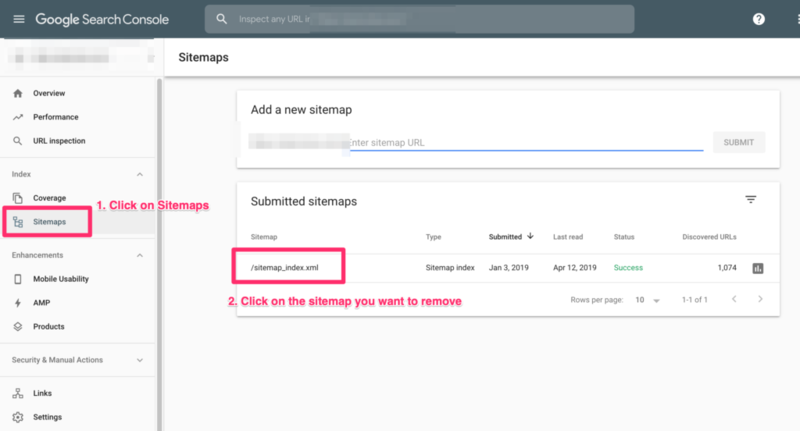 If you haven't enabled our sitemaps, please follow these steps first and, if needed, customize your sitemap index for your website needs. Google is our preferred search engine. If you haven't added your website to Google Search Console, please follow these steps first. Enter sitemap_index.xml into the text box that appears. If you made a mistake submitting the sitemap_index.xml file, you can delete it and re-submit it. Doing so is not expected to hurt the SEO of your site. Click on Sitemap in the Google sidebar. Click on the sitemap you want to remove. 3. Click on the 3 vertical dots in the top-right. In the sidebar, select your website. Click on 'Index' to expand the section and then click on 'Sitemaps'. If you haven't added your website to Bing Webmaster Tools, please follow these steps first. Sign in to Bing Webmaster Tools. On the My Sites page, select your website. In the left sidebar, click Configure My Site and then Sitemaps. Enter your sitemap URL into the text box at the top. Your sitemap URL will look like something like this: http://example.com/sitemap_index.xml. If you haven't added your website to Yandex, please follow these steps first. Sign in to Yandex Webmaster. On the home page, select your website. In the left sidebar, click Indexing Options and then Sitemap files. Yahoo site explorer was replaced by Bing Webmaster Tools. After you have manually connected the sitemaps to Bing and Google, each time a post is updated Yoast will then automatically ping the search engines to have them come crawl the sitemap. The following information is written for advanced users and developers.